I salute the frankness in these poems. I like how consistently Ken McCullough takes us there—into landscapes where he lives and has lived, filled with strongly vivid images, and into sometimes difficult, anxious, even ominous, states of mind and heart (“My only friend of late, the coyotes . . . I was better as a mirror than your man. / If I’d known myself I’d have never left. / If I had ever stopped equivocating”). There’s a range in this writing—fluent in what Adrienne Rich has called “metaphor as dialect,” he also relishes the actuality of many experiences, trusts their potency, which he records cleanly. It’s good to read a poet who shows a whole-hearted generosity of attention toward other people and to other ways of being in the world. (He also knows how to have fun, as in “Pear Poem,” which brings Stevens to mind, or “One Good Turn of the Corkscrew”.) I enjoy the overall narrative clarity, the momentum, the richness of sound, the often long movements of his thought. This book is quite a feast. I had almost forgotten the pleasure of reading poetry when I picked up Broken Gates. Ken McCullough is an old soul. His poetry is shamanic; it weaves along a liminal edge and then suddenly, pulls you underground. It opens you to the ocean in the soughing of ancient maple leaves, and to the spirit song of the chickadee, as only Chief Plenty Coups can hear it. It works like an umbilicus. At the point when you most desire to disappear, it brings you back to earth. "Ken McCullough’s wily, roaring, generous words tear down all the dull gates! McCullough has taken the roads less-traveled, and offers this stunning tour of spaces in his wild heart as well as those in the majestic world. I wouldn’t have missed this remarkable journey for anything!" There is a unique and personable honesty vital to the poems collected here. Their imaginative expression contains a lyrical authenticity not to be taken for granted as mere song. They taste the air. Their integrity perceives the light as well as its shadows. Reading Ken McCullough’s Broken Gates I am stuck by the distances in the poems, the vast interior of this country; Wyoming, Montana, Minnesota, New Mexico, Arkansas, Mississippi …. These are poems that live the beauty and the hardship and take into account the ironies of modern life and the wilderness; the cell phone on the mountaintop. These are poems that do not take the flight from New York to LA, but spend days travelling the dusty backroads of America and beyond. I really, really like these poems, and the general splay of it all, their clarity and directness, a voice that is completely at home, not begging for attention, not overreaching in an effort to impress. Why is there so little of this in American poetry? It’s a splendid book, I can say after several readings, and I have enjoyed it all, especially The Time, Find, Diet for the Smallest Planet and Wake, but all of it, the variety and earned accomplishment of your various voices. This is mature McCullough, and that means a splendid read, work that can be trusted, as it is tested.,,, Red Dragonfly made it beautiful for you, too, as you deserve. When we were students at the University of Iowa Writers Workshop back in the 1960s, before the proliferation of university and college writing workshops, Ken McCullough lived in a cabin in the woods, as I remember it, despite his city cred….One of my favorite books of poetry is his 2003 book OBSIDIAN POINT (Lone Oak Press). It’s a good introduction to the man, his life and perspective on it, and his writing. And in many ways, it’s his most emblematic and yet most unique book as well. 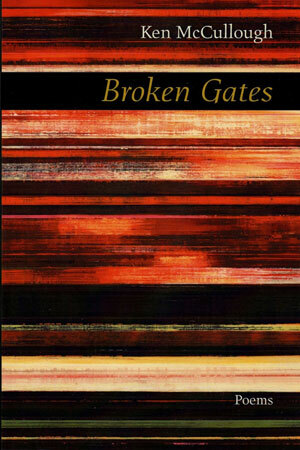 BROKEN GATES is his latest and is the poetry of an older man. Still with his hands in the soil and the rugged lifestyle …and his rural dailiness, but with a more nostalgic tone. He was always reflective and he’s still more active than I’ll ever be, but he’s also, at least from my perspective, more gentle on himself and accepting. I found your work to be full of a kind of calming authority. If I’m ever lost in the woods, God forbid, I hope you turn up. I loved the sense of external/internal journeys that seem in some ways at the heart of the poems, and your connection to the natural world is something I can only envy.